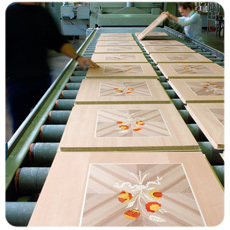 The application of the veneer to the panel (solid wood, listellare, chipboard,mdf, tamburati, etc) takes place through an in line automated process which allows to make remarkable quantities of materials. 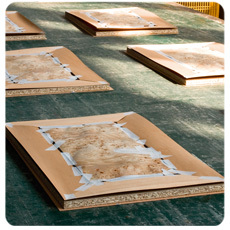 With operators’ supervision of the specific competences, raw supports are automatically moved through the following processes: dissection and squaring of panels in type, size and thickness required by the client; adhesive spreading of panel; planking (usually inlay veneers or simple wood essences); hot-plating; lower smoothing; higher smoothing; down smoothing. The immediacy of passages between the different phases definitely facilitate the tricky smoothing procedure: cooling wood (a natural material) tends to bend and corrugate, so that smoothing become impossible. With inline plating, material does not have the time to deform since it is processed in one single solution. The precision of the machinery allows the smoothing of surfaces of few tenths of a millimetre thickness. 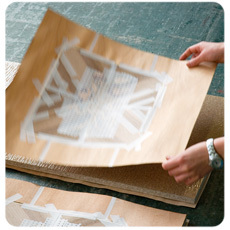 We guarantee processing of single pieces of over 6 metres length. Bender compression From our client’s idea to practical realization, we bend and shape all wooden materials, such as veneer that can be faced with requested inlays an essences.